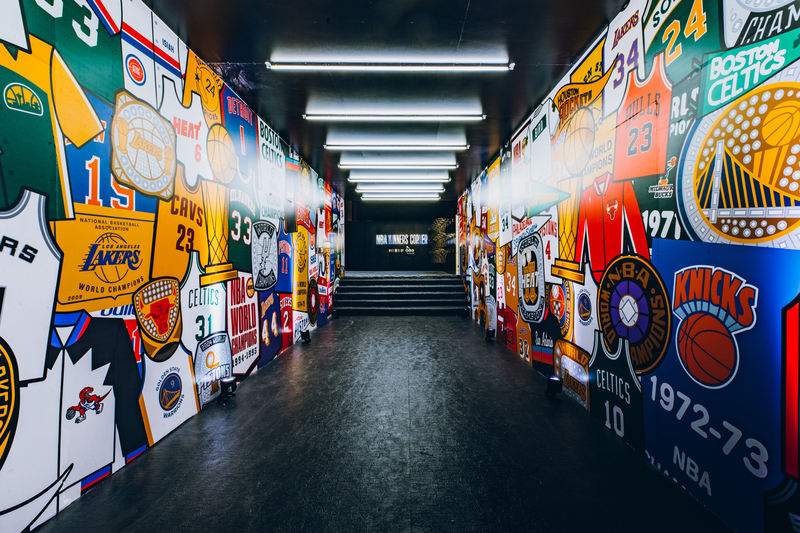 The NBA Winners’ Corner experience begins in a carpeted hallway, decorated on either side with vibrant illustrated murals and iconic uniforms. Former champion Gary Payton (left) and Robert Horry, winner of seven NBA titles (right) next to the Larry O’Brien Trophy. Eighteen gold basketball hoops represent the 18 different teams that have won the championship. Shaquille O’Neal’s autographed shoe is a mere size 23. 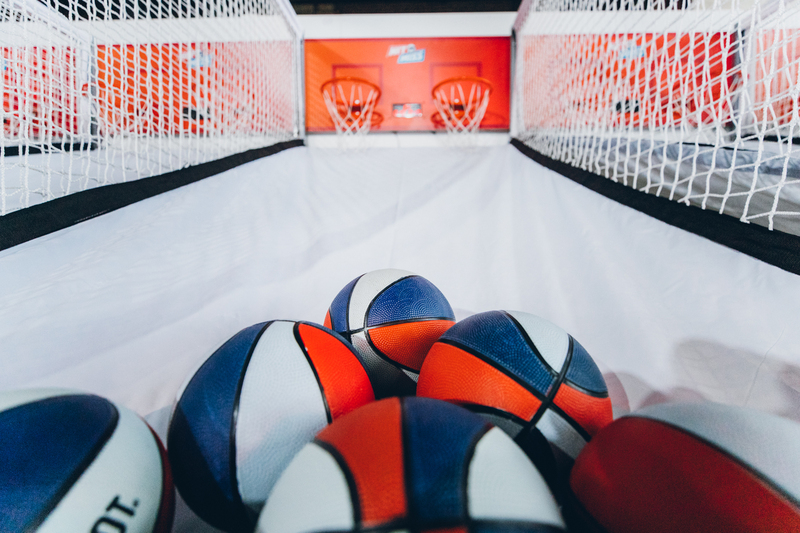 A half-sized NBA court offers visitors a chance to shoot a buzzer-beating shot. Pop-A-Shot machines offer a fun shooting alternative. Basketball fans can now get close to an authentic NBA Playoffs experience—without the burning eyes from the champagne victory shower. 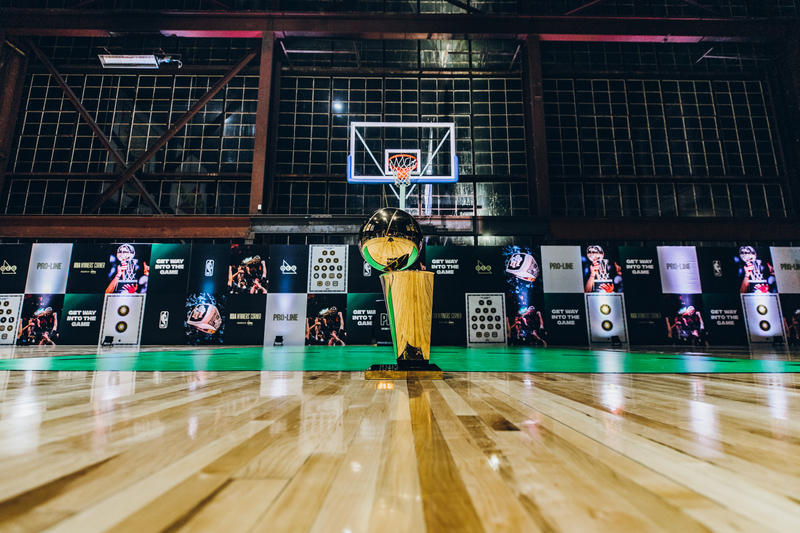 Located in downtown Toronto, the NBA Winners’ Corner presented by OLG, an immersive 13,000-square-foot pop-up installation, includes an NBA hardwood half-court, fascinating memorabilia from the Naismith Basketball Hall of Fame, ticket giveaways, and myriad opportunities to meet and hear from former champions and legends. Coinciding with the start of the 2019 NBA Playoffs, the NBA and the Ontario Lottery and Gaming Corporation (OLG) have come together to create the space for fans, giving them a free exhibition that will entertain both casual game-goers and diehard hoop heads. The experience begins in a carpeted hallway, decorated on either side with vibrant illustrated murals and iconic uniforms, along with championship rings, pennants, and logos. A black wall with 18 gold basketball hoops represents one for each of the 18 different teams that have won the championship. The room then opens up into a massive, high-ceiling space with a half-sized NBA court, replete with stands, for visitors to test their skills at reliving those buzzer-beating games. If you’re not quite up for the dramatics, eight Pop-A-Shot machines provide a low-key alternative. 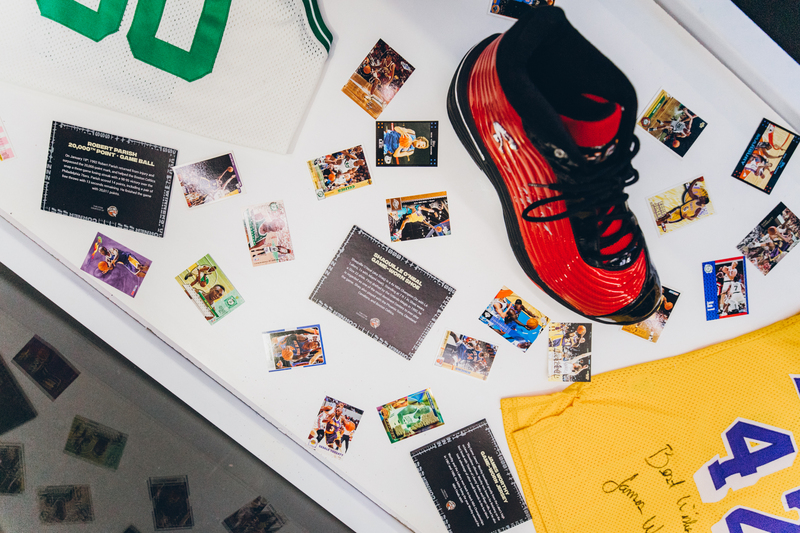 Another space, dubbed Champions Room, brims with vintage videos, photographs, and game-worn memorabilia, including Shaquille O’Neal’s autographed shoe (size 23). Even better, guests will have a chance to hear from legends who have played in the NBA Finals themselves, such as Los Angeles Lakers great and three-time NBA champion James Worthy; clutch shooting Robert Horry, winner of seven NBA titles; and former champion Gary Payton. Fittingly, the crowning piece is the Larry O’Brien Trophy. 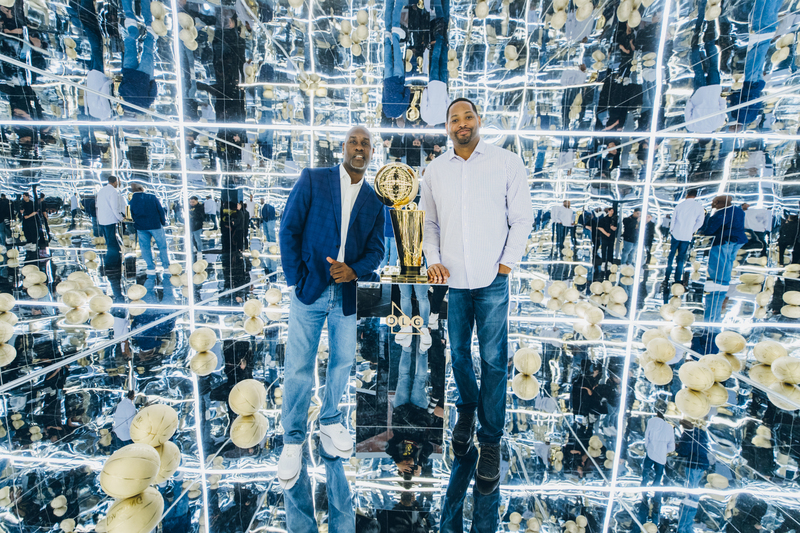 The NBA’s championship hardware, made by Tiffany & Co., is squared away in a mirrored room that gives off an infinity effect, where the trophy and gold basketballs strewn about the room stand out from every perspective. 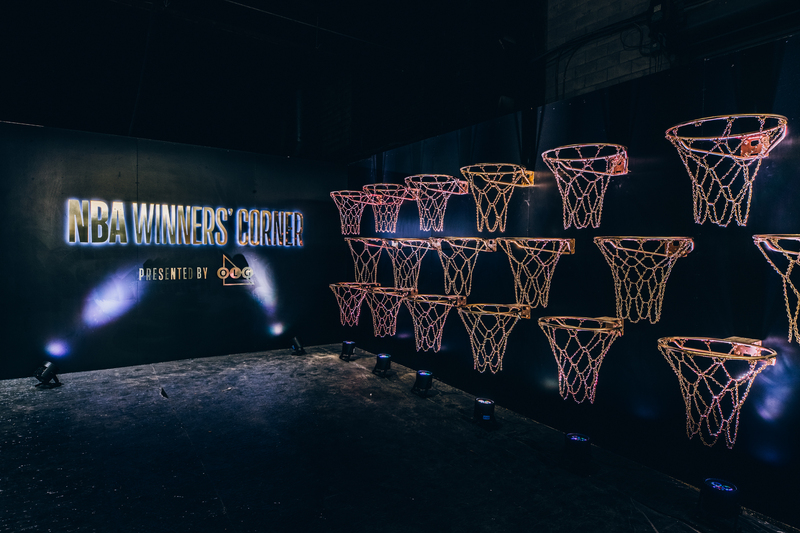 NBA Winners’ Corner runs at 950 Dupont Street until April 20 and is open to guests aged 18+. Photos provided by the NBA.